The two days of meeting of the Centres of UNIMA (International Union of the Marionette), section Africa, made possible interesting and constructive exchanges. The presidents of the different centres was able to reflect together on the strategy to put in place for the four coming years for the UNIMA Commission Africa. Also, they discussed concerning “The place of the puppetry arts within the artistic events in Africa and elsewhere” during a lecture animated by Were Were Liking, then, they reflected “How to protect and encourage the transmission of the different kinds of puppetry in danger of disappearing ?” with valuable speakers: Danaye KALANFEÏ, Yaya COULIBALY et Jacques TRUDEAU. The days 8th and 9th of March 2016 was dedicated to puppets shows held in the frame of the MASA. Numerous children from the schools of Bingerville and Abatta came. 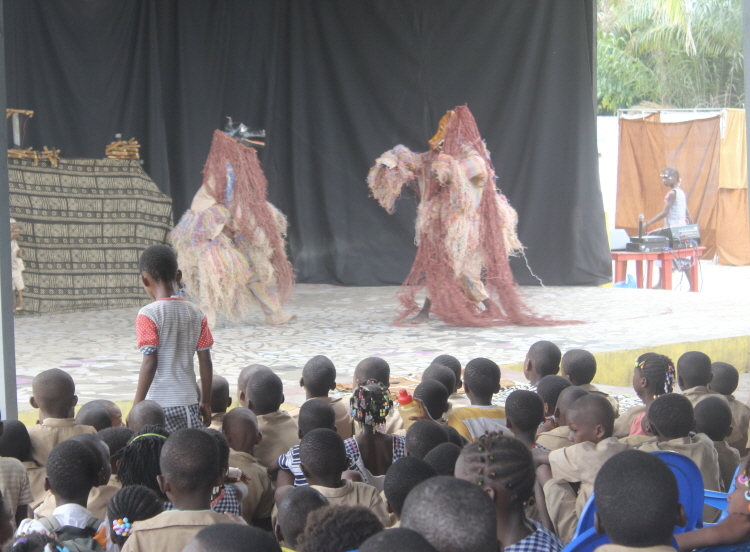 – Company Ivoire Marionnettes of Badrissa SORO “La main qui donne”. The meeting ended with the recognition ceremony toward the elders of the puppetry in Africa: WERE WERE LIKING, Danaye KALANFEÏ and Yaya COULIBALY. The elders was doubly thanked, a first time by the members of the UNIMA Commission Africa and, then, by International UNIMA. The Commission Africa also wished to thank Jacques TRUDEAU for his support and his presence during this meeting.